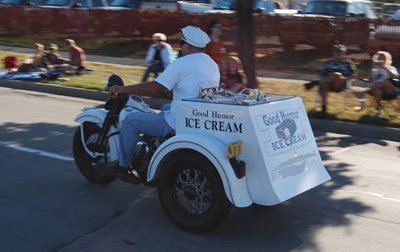 The Good Humor Man was driving his motorcycle on the parade route yesterday morning, but I don't recall seeing him in the parade itself. 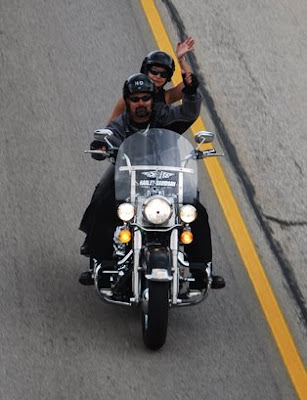 Perhaps the fact that there were 7500 motorcycles in the parade and that I was trying to take pictures had something to do with it :) . In any case, this beautifully restored example of a '50s-era delivery cycle, and its driver in his clean, white uniform, were a great attraction. 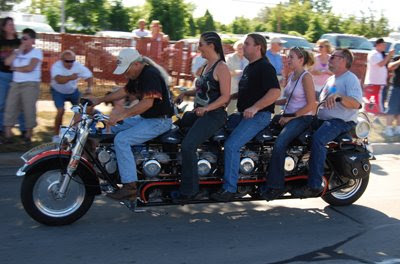 Built this summer in Shawano, WI, the Four-Tee-Five has four Harley Flathead motors, and accommodates five riders. This bike was one of thousands in the parade from Miller Park to the Maier Festival Grounds today, and it was certainly the most unusual one I saw. 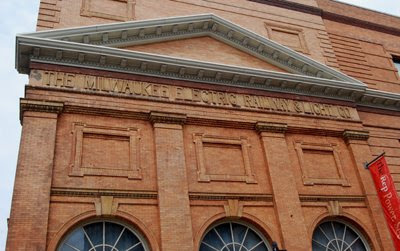 Founded in 1896, the Milwaukee Electric Railway and Light Company provided transportation and electrical power to the area, and its interurban transit lines ran west as far as East Troy. Eventually, the company would become part of the Wisconsin Electric Company, now known as WE Energies. This building, on Wells Street and the Milwaukee River, was once a powerhouse, using the river to generate electricity. Today, it is used as a performance space by the Milwaukee Repertory Theatre. Jones Island was once home to a community of immigrants who fished the waters of Lake Michigan off the shores of Milwaukee. The Kaszubes, originally from Poland, lived and worked on the island, and were eventually displaced in the early 20th century. Kaszube's Park is on Jones Island, and is the smallest park in the county. 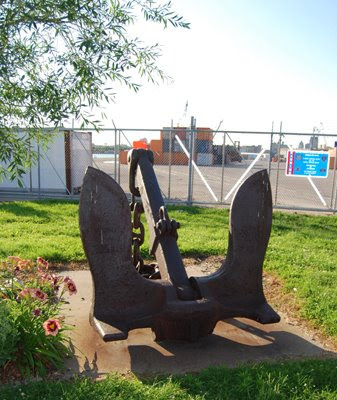 In addition to this anchor, there is a plaque commemorating the inhabitiants of this settlement. Today, the island is a peninsula, and is populated with various industrial firms. Completed in 1931, the County Courthouse is on 9th Street just north of Wells Street. 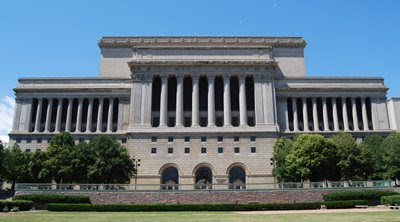 The limestone structure is on the National Register of Historic Places, and has been called one of the grandest buildings of its type in the country. Frank Lloyd Wright, probably the most famous Wisconsin architect, once referred to the building as a "million-dollar rockpile". Statues in the open spaces adjacent to the courthouse feature Mahatma Gandhi and Douglas MacArthur. 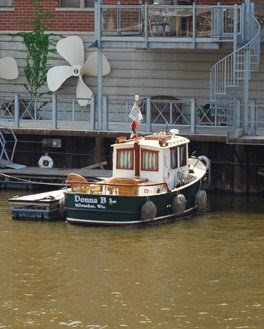 Found this boat on the Milwaukee River, berthed just east of the Water Street bridge (the word 'cute' comes to mind, but I don't know if it fits or not :) ). It looks like a great way to cruise the river, or just to sit in the large chairs on the deck and watch the world go by. August is almost over, the back-to-school sales are in full force, and the weather's starting to cool off a little. Take some time, get out, and enjoy the summer while it's still around! Originally built in 1853, the Gipfel Union Brewery operated at 423 W. Juneau Avenue until sometime in the 1890's. As one of many small independent breweries in Milwaukee, it eventually fell victim to competition from the larger breweries in the area. It is the oldest known surviving brewery building in the city. It currently sits on an empty lot on Third Street just north of Juneau. Current plans for the building are to restore it and integrate it into a development planned for this block. Today, approximately 2000 freshmen will move in to their dorms in the Marquette University residence halls. 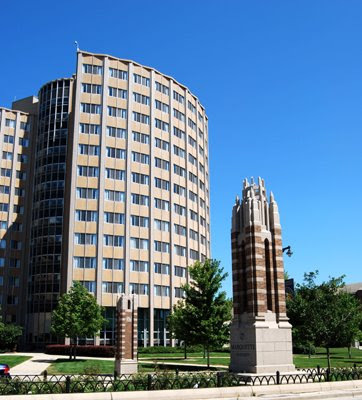 This building is McCormick Hall, a co-ed dorm on the corner of 16th Street and Wisconsin Avenue. The 11-story building houses over 700 students in double- and triple-occupancy rooms. Ahead of schedule AND under budget... not something you hear about most public works projects. Today, the ribbon cutting to officially re-open the Marquette Interchange will mark the ceremonial end of a project that has disrupted traffic for over four years. 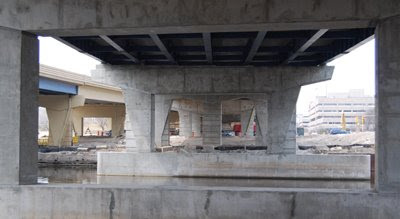 These pillars are part of the rebuilt I-794 spur as it passes over the Milwaukee River. 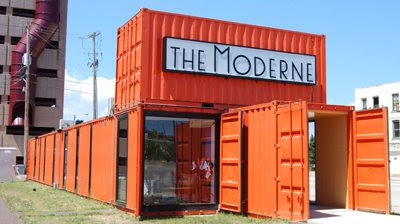 When I first drove past, I was a intrigued by the shipping container construction of this building, and wondered what it was all about. Funky new restaurant or club, perhaps? The answer was much more pedestrian. It's a sales office for more condos downtown. The Moderne is a 30-story, mixed use building proposed for this corner at Juneau and Old World 3rd St. The building will include a 120-room hotel, 80 condos, a day spa, and retail space. There is a lot of development in this area, where the old Park East Freeway once stood. I just wonder if all these recently built and proposed spaces will ever sell. Old St. Mary's Church is on Broadway between Kilbourn and Wells. 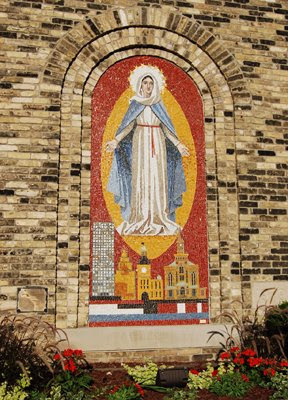 This mosaic is next to the main entrance to the church, and features a number of prominent Milwaukee buildings. The buildings are (from left to right): the US Bank building (originally the First Wisconsin building), the Wisconsin Gas Company building, City Hall, and Old St. Mary's. 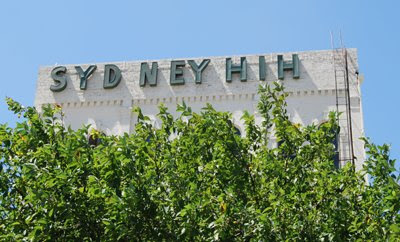 The Sydney Hih building is on the corner of 3rd St and Juneau Avenue. While it's painted white today, it was once covered with a patchwork of colors, making it a unique landmark downtown. The fate of the building is yet to be determined, as developers plan to build a hotel on the site. Marie Claire Magazine has declared Milwaukee "America's Sexiest City". 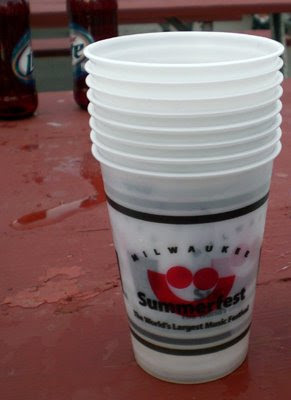 One of the reasons given is our numerous summer festivals, the biggest of which is Summerfest, held every year in late June and early July. The 2009 dates are June 25 - July 5. This weekend is Irish Fest at the Maier Festival Grounds on the lakefront. Sláinte ! 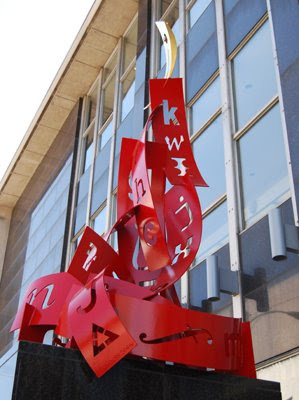 This sculpture is one of a pair that sits in front of the Milwaukee Public Library at the Wells Street entrance. 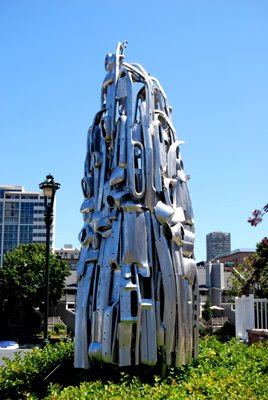 The work, by Richard Taylor, is called "A Beam Of Sun To Shake The Sky". Its bright red finish and gold flame at the top really catch your eye as you drive down the street. A big thanks to Jeff Sherman over at OnMilwaukee.com for the kind comment in today's "OMC Recommends" column. 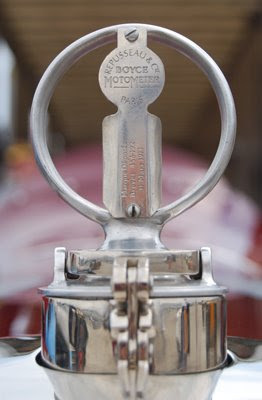 I know a lot of you come here from OMC, and your visits are appreciated. Have a great weekend! 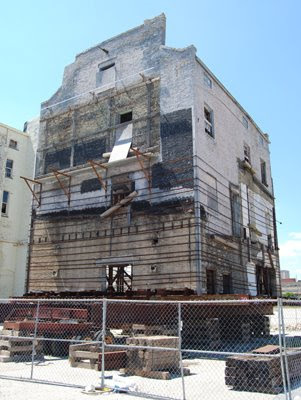 This building at 1699 Astor is currently home to Johnsen Schmaling Architects. 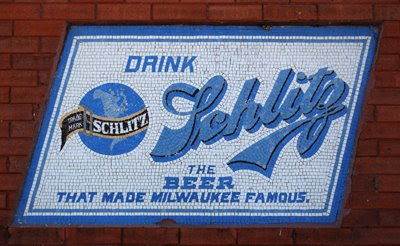 Based on this mosaic on the Brady Street side of the building, I'd suspect this was originally a Schlitz tavern. As I mentioned in an earlier post, many of the taverns in town were once supported by a specific brewery. Schlitz's 1960's formulation has been reintroduced, and is available again in many locations. You can read more about the brand and its history on their website. 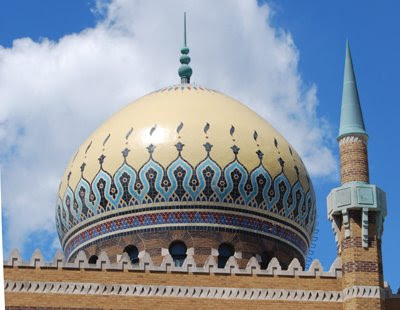 The Tripoli Mosque on Wisconsin Avenue is fashioned after the Taj Mahal. It is home to the Shriners for the city of Milwaukee and state of Wisconsin. 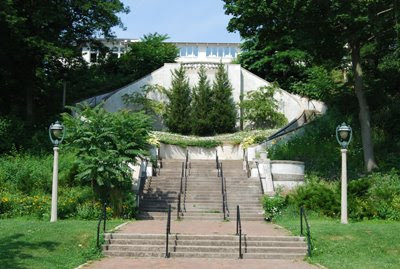 Completed in 1928, the buliding is on the Register of National Historic Places. The Shriners support a network of hospitals that serve children with orthopedic and burn care to children under 18, and the care is provided free of charge. The building was recently made available for rentals. If you'd like to learn more about the Shriners, the temple, or their philanthropic efforts, you can read about it on their website. 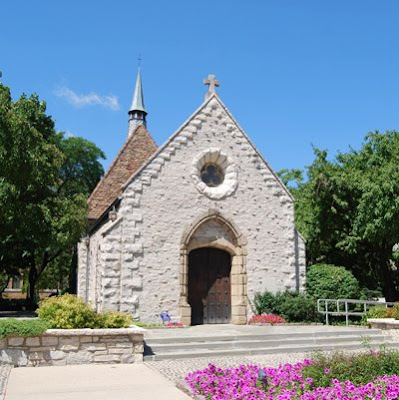 Although the actual time is not known, this chapel at Marquette University is suspected to have been built during the 15th century in Chasse, France, near Lyon. After falling into decay, the chapel was moved to Long Island, New York, and eventually to the University. Certainly the "oldest" building in Milwaukee, you can read about the history of the chapel here. 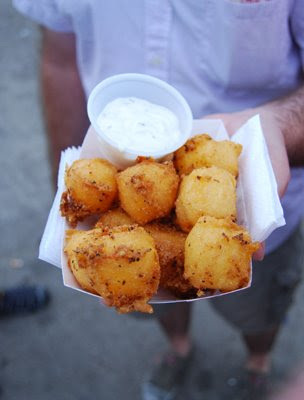 There's only two more days left of the State Fair, so get on over there and enjoy some food on a stick! 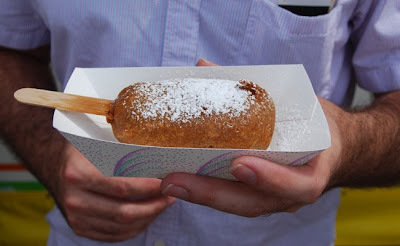 Today's photo is the S'more on a stick (deep fried, of course). Chocolate and marshmallow covered in a honey graham cracker crust and fried, then given a powdered sugar dust. Sweet melted goodness, for sure! If you're going to search this one out, it's just across the street from the Wisconsin Products Pavilion, about 25 yards south. Sorry for the delay today, but the call of the fish in the great north woods was too much to resist. As I'm sure everyone knows, today is the opening ceremony for the Olympics in Beijing. These flags are in front of the Manpower corporate headquarters downtown. 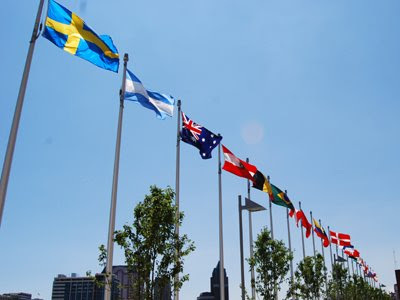 Manpower has a huge global presence, and these flags represent all the countries in which they do business. Good luck to all the Olympians!! 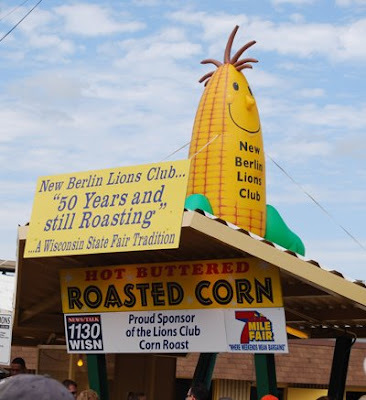 One of my earliest memories of the State Fair is this Roasted Sweet Corn stand run by the New Berlin Lions Club. Stand in line, buy your ticket at the cage, trade that for an ear of delicious corn dipped in melted butter. Add some salt and nibble your way to food nirvana. Over the 11 days of the fair, they use 100,000 ears of corn, 2,000 pounds of butter, and what must be a million napkins. For $3 per ear, it's one of the best food deals at the fair. 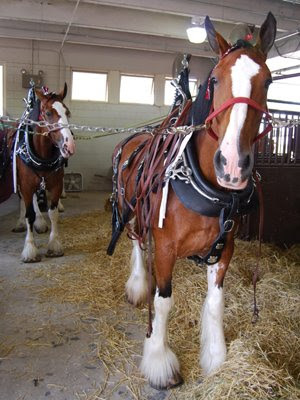 These horses were being prepared to show as part of the 2008 National Clydesdale Show. Held in conjunction with the State Fair, the show ran from this past Thursday through Sunday. With over 25 different classes of competition, the show featured some of the very best of the breed from all over the United States and Canada. The Fair runs through Sunday the 10th, so get out, see the animals, and enjoy! I was downtown Saturday taking pictures, and stumbled upon the Fat Abbey Biercafe. 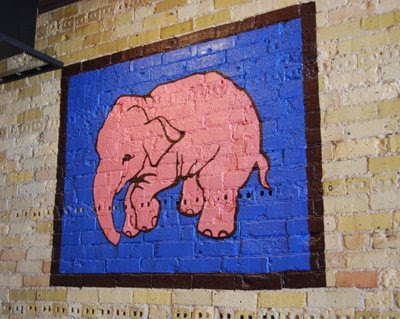 They have a great selection of beers with an emphasis on Belgian Ales (the pink elephant pictured above is associated with Delerium Tremens). The menu has a wide range of selections. I tried the Blackberry Turkey sandwich, and it was delicious, served with a generous side of very good fries. The OnMilwaukee.com interview with one of the co-owners can be found here. Today's picture comes from a request from Middletown Daily Photo blogger Bernie. 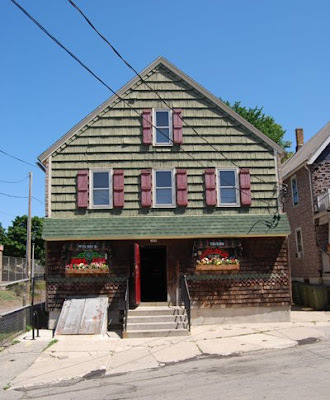 Wolski's is a tavern on Milwaukee's East Side, and has been since it opened in 1918. Primarily a beer bar, the tavern is a great place to stop for a cold one on a hot summer day. Wolski's claim to fame is the "I Closed Wolski's" bumper stickers that can be seen all over town. Customers take the stickers with them on their travels, and send back pictures that are hung on the walls of this landmark establishment. 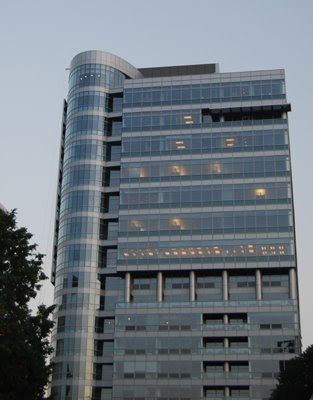 This office building is on the corner of Jackson and Wells, adjacent to Cathedral Square Park. 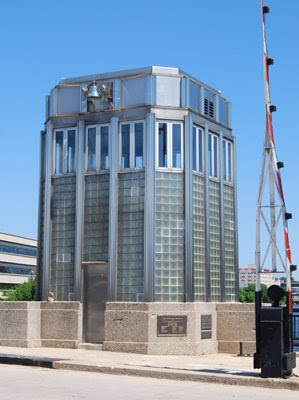 It stands out in Milwaukee due to its extensive use of glass and metal on the exterior. Placed among the older brick buildings in the area, it provides a unique contrast with its modern design. The August 2008 Theme Day is Metal! 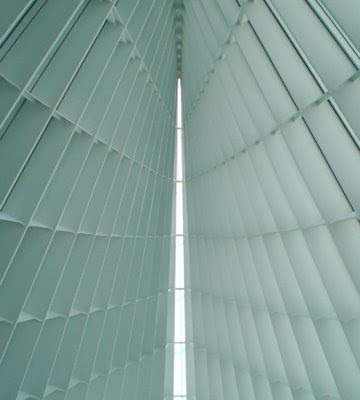 This picture looks up on the 90-foot steel and glass ceiling of Windhover Hall at the Milwaukee Art Museum. The Santiago Calatrava-designed Quadracci Pavilion also includes a brise soleil with a 217-foot wingspan. With its postmodern style and bright, open spaces, it has been used in a number of television and print advertisments.